We don't usually get a lot of winter action in November or December around here, but this year things got an early start. We had an ice storm and Pierce got a day off school. I took a few pictures around the place. Thankfully, we didn't have anywhere we needed to be early that morning. And the ice melted in time for us to get Reid to the doctor later that day. Poor Reid had pneumonia. Second child in our home to get it in the past month. Very strange - as it's not a typical occurrence for us. I like seeing the trees weighted down by ice. There's something silent and beautiful about it. How about you, readers? Do you like winter weather, if you have no place you need to go? As you're getting it ours is clearing away; glad you were able to get to the doctor safely. Hope Reid gets better quickly and you all have a happy and healthy Christmas! Winter weather always gets a big BOO from me; just call me Ms. Grinch. I think we got lucky on that last ice storm as it was not as bad as predicted. I thought about the road to your farm. Whew! Scary. The ice looks so pretty in your pictures. I remember my first year living in SC the ice storm knocked down power lines and I was out of power for over a week. Glad it all melted. Hope everyone gets better!! That's what it looked like over here. I was glad that it didn't stick on the roads. Pneumonia? Yuck! I sure hope your son gets better fast. I love the fall and winter seasons, and the ice is beautiful (we had it too), but so destructive. I like your positive attitude! This weather is a great opportunity! 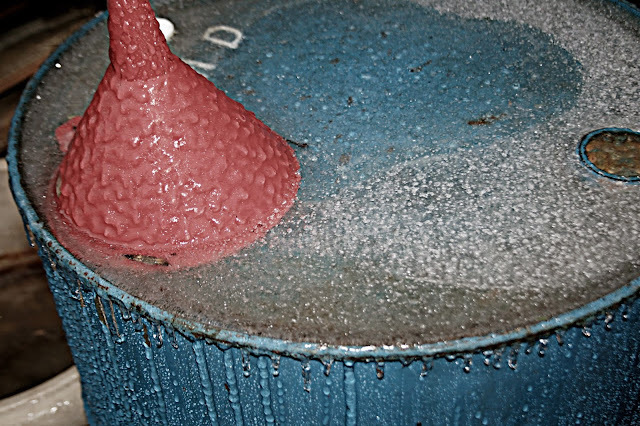 This Winter is off to an icy/dicey start. Bah Humbug! hope your boys get well. pneumonia starts as a cold, & moves on it that, right? is Reid improving quickly? my hubby has been with a cold - lots of coughing lately. we have tried really hard to keep me from getting sick. knock on wood so far i am ok. i have taken my vitamins & all that jazz. did you see that vitamins are not needing any more ... the silly news. what will they say next? always amazed how different Virginia's weather is. was this ice storm recent. yesterday we had 60s degree temps. today is suppose to be similar. we will see? 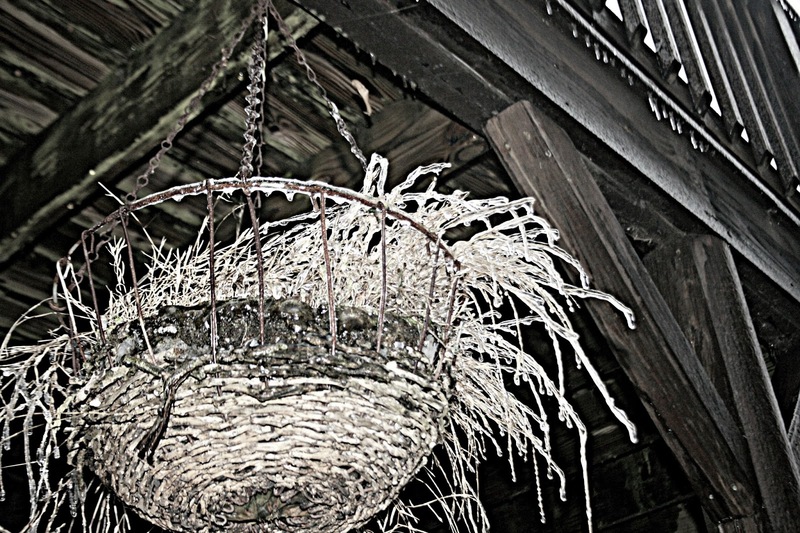 The frozen hanging basket is so cool! Sorry about Reid; hope he's all better. That's such an awful kind of storm, but so pretty at the same time. I used to love Winter, the colder the better the more snow youpi, but I've turned into a bit of a Winter Grinch and do prefer this South of France temperament. Your photos are very pretty. I hope Reid gets better quick! So sorry pneumonia in your home; hope Reid is better soon. Yes, I like winter weather as long as I don't have to get out in it! Driving on icy roads is the worst. I hope Reid feels better soon, poor guy. I hate that you had all that ice - I really do believe that ice is a hundred times worse then snow! You have to be so careful. The pictures are amazing. 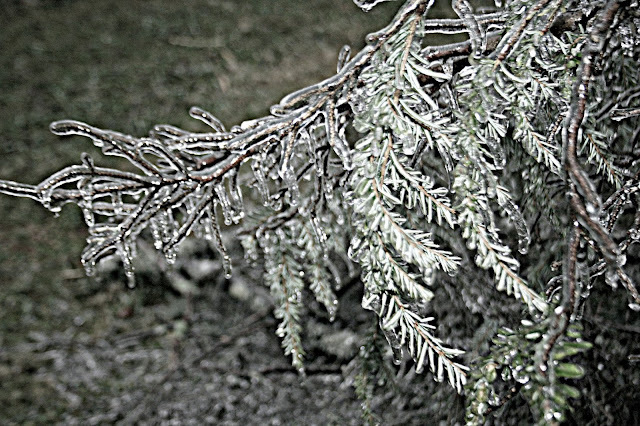 I do love a good ice storm providing no one has to go out in it, they are so dangerous! I sure hope Reid is feeling better; poor thing. 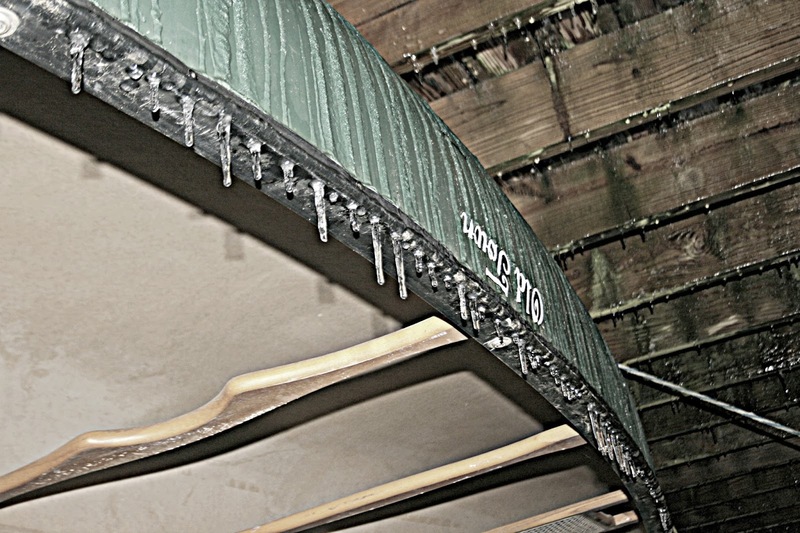 As long as you get to stay home safe and sound….ice is pretty. I don't mind winter weather -- but ice is scary -- we've had our share over the years and have lost some big trees. Glad you all are okay -- hope the boys get and stay healthy. It was warm here earlier this week. Now it's cold. I use to like winter, snow, ice and cold. But as I get older I would be happy with less of each. haha! All frozen, it must be so cold. We never see it here. The drops of the snow looking beautiful, such beautiful photos..
oh gosh i hope reid is feeling better now! i like winter weather as long as i can be tucked in the house with the fire going...i hate it though when i know ashlyn (my oldest) has to be out driving in it...it always scares me now! merry christmas lisa! I agree with Sandie's comment. Ice is much worse than snow. I am sorry to hear that one of your boys got pneumonia. I hate extreme weather conditions, like Winter & Summer time. I prefer Spring and Fall with mild lovely weather. I'll pray for your little boy complete healings and prompt full recovery. Happy Holidays, Lisa, family and beloved ones! We're having quite an autumnal weather here, very strange for Finland. We usually get ice storms up here sometime in the winter. Everyone takes it in stride. We've got a fireplace in our living room, and cut wood ready to burn, in case the power goes out. It's just and everyday fact of life. Glad your situation wasn't worse! Sorry for poor Reid with pneumonia! I had that this autumn; it is not fun. I like winter weather for about a day. After that I'm ready for spring! Lisa, I hope your son gets better really soon. I figure with a mom and dad like he has he will be well cared for. I don't like weather events like ice. The logistics burden here increases dramatically. Oh my gosh, I am so sorry! Is he miserable and coughing a lot? Poor little guy, on antibiotics I suspect. My favorite here is the hanging basket with the ice. 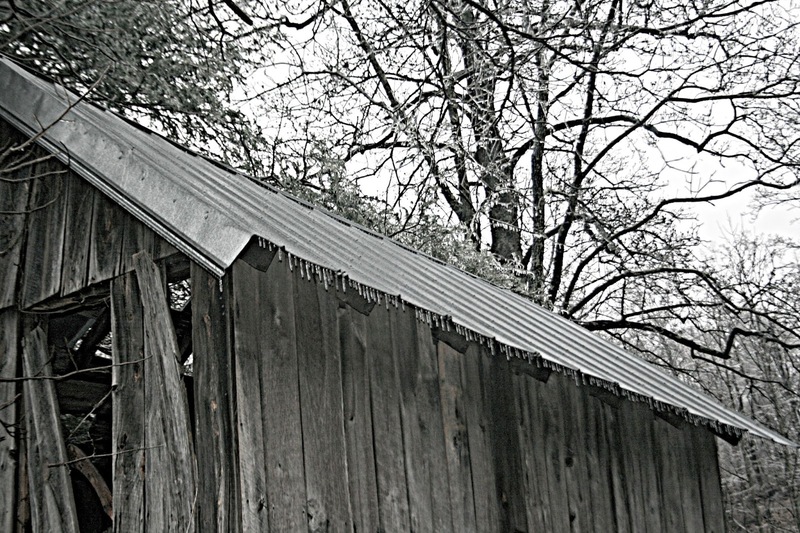 Ice storms do so much damage! It's really beautiful though. Wow! That's a lotta ice! I hope Reid feels better soon.